Mozzarella Portabellas | Dizzy Busy and Hungry! Just a note: This recipe originally appeared as a guest post on Jersey Girl Cooks. I have now posted the recipe here as well for archiving purposes. My original teaser post is below and the recipe is underneath it. 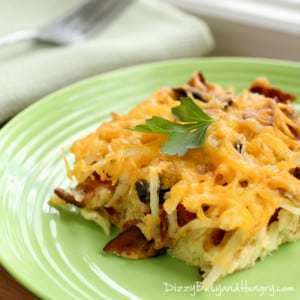 Make sure you check out Jersey Girl Cooks, too; Lisa has a ton of great recipes! Happy Friday, everyone! 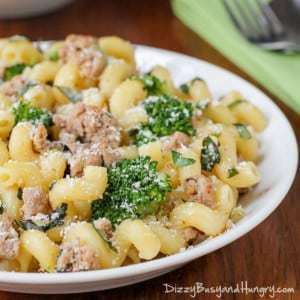 I am guest posting today over at Jersey Girl Cooks. Lisa is an amazing blogger who has taught me so much over the last few months as I have been working to get my blog up and running. Her recipes are wonderfully creative and delicious, and family-friendly and easy, too! You can check out this page on her site to get to know her a bit more. 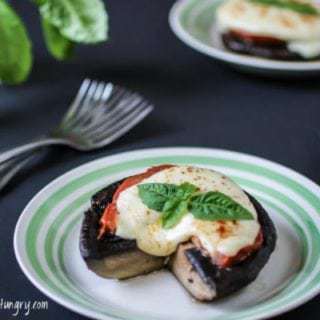 I came up with the recipe for these mozzarella portabellas just by combining some ingredients and flavors that my family really loves, and they were so delicious, both Things and DH now keep asking me to make them again and again! Head on over to Jersey Girl Cooks to read the full post! Remove the step from the mushrooms and wipe with a damp cloth to remove dirt. In a small bowl, combine olive oil, garlic powder and salt. Brush the olive oil mixture onto the tops of the mushroom caps. Place the mushrooms on a baking sheet, gill side down, and bake for 15 minutes. Remove mushroom from oven, and flip them so the gill side is facing up. Place one tomato slice on each cap, then top with mozzarella cheese. Place back in the oven and bake for another 5 minutes, until cheese is hot and melted. 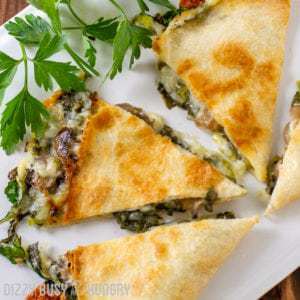 Remove from oven, garnish each mushroom with a fresh basil leaf, and serve. Boy, these portabellas look absolutely delicious! I’m not a big fresh tomato fan, but I bet it might be pretty good with sun dried tomatoes instead. The next time I’m at the super nice gourmet grocery store, I’m picking up the ingredients to make this. Congratulations!! 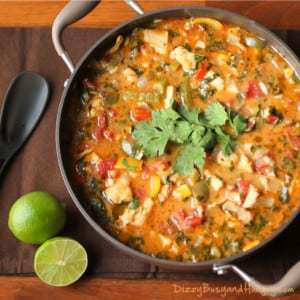 Your delicious recipe has been featured at Tasty Tuesdays 55 on my blog, Lori’s Culinary Creations. Hop on over and grab a feature button and link up your latest culinary creations. Congrats again. 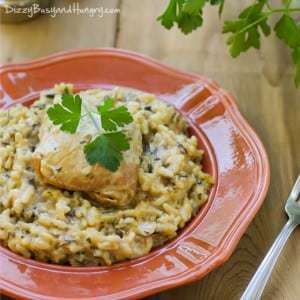 I love portabella recipes and this sounds delicious! Thanks for sharing it on the Thursday Blog HOp!! I can’t wait for my basil to crop up so I can use it in this recipe and everything else. must try these!! never thought to do this with portabellas! newest follower from the FB frenzy 🙂 pinning for later girl!!! Such a simple delicious meal… great for lunch or dinner. 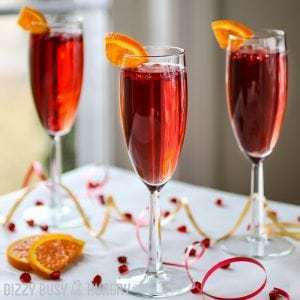 I’m pinning this thank you for sharing it with us on foodie friday. This is incredible and I just love portabellas!! Thanks for posting to Tasty Tuesdsay’s #20. Looking forward to seeing what you post next week! Thanks, Lori! Appreciate you stopping by! Thanks for being a guest blogger! 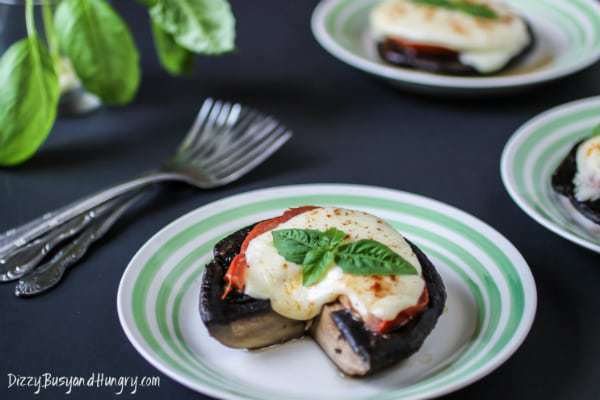 I will be making these portobellas soon! These look delicious! I love things like this! Thanks! They were so easy and Thing 2 has requested them again several times since I made them, so they will definitely become a regular dish in our house! These look so good. Portabellas are on for my favorites. Thanks Shannah! I totally relate, I love portabellas too!